Piedmont Technical College held graduation December 17, 2015. Those graduating from this county are found below: EDGEFIELD – Scotty Burton, associate in applied science, major in computer technology, network concentration; and Latockqua S. Daniels, certificate in office technician. JOHNSTON – John Walter Moody, associate in applied science, major in nursing. 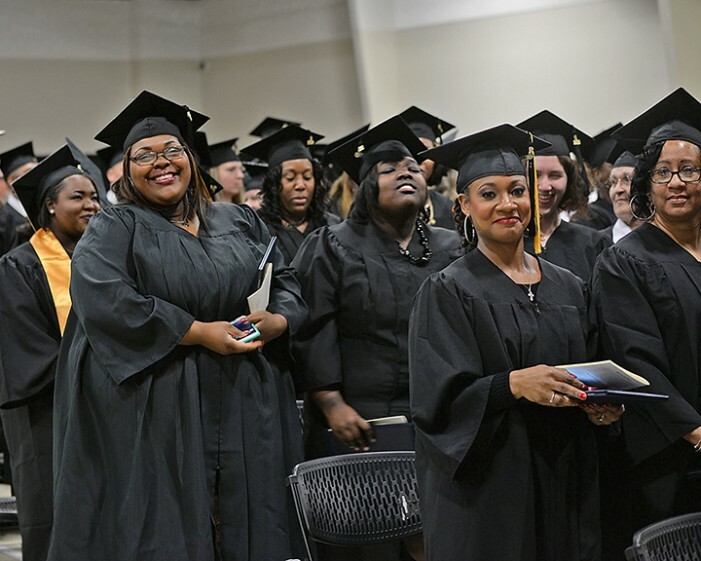 The James Medford Family Event Center at Piedmont Technical College welcomed more than 350 Piedmont Technical College graduates for a commencement ceremony to celebrate their accomplishments. Brooks was followed by the commencement speakers. The address was delivered by two graduating students – Cheryl Mackey, a computer technology major from Greenwood; and Hannah Byerly, a diversified agriculture and horticulture major from Greenwood. Mackey shared her journey from Albany, NY to Greenwood. Her lack of credentials limited her career choices, so she enrolled at Piedmont Technical College. She told the graduates that her success was proof that they should never stop reaching for their goals. Byerly grew up working with horses. She always knew she wanted to go into the agriculture field and the joy she found helping children learn to ride opened the door to what she wanted to do. She credits Piedmont Technical College with putting her on the path to success. The winners by their counties of residence and their majors were: Abbeville: Grace Nelson, administrative office technology; Greenwood: Michelle Moorhead, business; Juan De Leon Hernandez, human services; and Antonio Rodriguez, mechatronics technology; Laurens: Cameo Hollingsworth, administrative office technology; Newberry: Kaytlyn Long, Associate in Arts; and Saluda: Evon Brooks, Associate in Arts. Presenting this year’s graduates was Andy Omundson, associate vice president for student affairs. Certificates, diplomas and associate degrees were conferred by Brooks and Dr. Jack Bagwell, vice president for academic affairs, with assistance from board chairman Y. J. Ahn; Dr. Bradley Griggs, dean of Arts and Sciences; Dr. Jerry Alewine, dean of health science; Tara Harris, dean of nursing; Sissy Copeland, dean of business, information technologies and public service; and David Kibler, interim dean of engineering and industrial technologies. The macebearer was Allen Barbare, faculty senate president-elect. The mace was designed by members of the faculty and staff and presented to the college in 1991 by PTC’s Alumni Association. Music was provided by Emerald City Brass. The Reverend Richard Cain, pastor of Lanford Baptist Church in Enoree, delivered the invocation and benediction. PLEASE NOTE: PIEDMONT TECHNICAL COLLEGE’S DECEMBER 2015 GRADUATES AND THEIR AREAS OF STUDY ARE LISTED BELOW. EDGEFIELD – Scotty Burton, associate in applied science, major in computer technology, network concentration; and Latockqua S. Daniels, certificate in office technician. JOHNSTON – John Walter Moody, associate in applied science, major in nursing. McCORMICK – Porcha Tyesha Anderson, associate in applied science, major in nursing; and Tomaro LaCourtney Cohen, associate in applied science, major in human services.